Transmission rebuilding requires precision cleaning of the transmission's external and internal parts. Gears, shafts and casing must be cleaned for inspection and repair prior to reassembly. 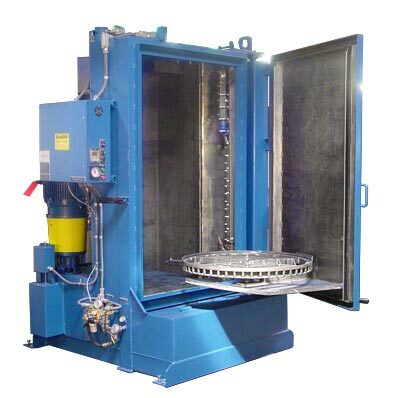 The automatic StingRay solvent free parts washer is a great tool for saving time and improving your transmission remanufacturing, repair and rebuilding shop. Place the transmission parts in the washer, start a cleaning cycle and come back in 15 minutes for parts that are contamination free and dry. Pre-cleaning the complete transmission takes only minutes in the aqueous parts washer. Pre-cleaning prevents the migration of grease and oil into the rest of the shop and makes disassembly easier as all bolts are readily accessible. After disassembly the case, pan and all gears, shafts, nuts and bolts can be quickly cleaned in baskets in the aqueous washer. A 15 minute wash at 180 degrees F (82 C) removes all road soils, grease, and grime on all the parts. Power Kleen IIIL detergent is safe for aluminum as well as all metals and rinses well leaving no residue. A rust-inhibitor injector pump on the hot fresh water rinse system prevents corrosion and flash rust on the parts after cleaning leaving ample protection time for re-assembly. 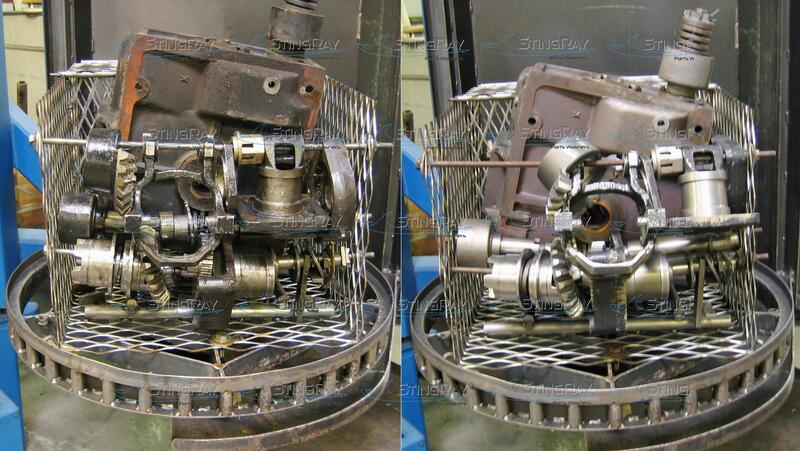 Transmission Parts Washer before and after Cat off-road equipment. "Click image for zoom." The StingRay power wash system and the unique oscillating blast system assures cleaner parts. Saves time and money by reducing cleaning time so your rebuilders can earn money rebuilding instead of cleaning transmission parts. Pinion gears, sprags, torque converters, solenoids, pressure plates and bands are all cleaned in a StingRay Parts Washer. The aqueous wash process is safe for all transmission components and quickly removes grease, oil, and years of grime. 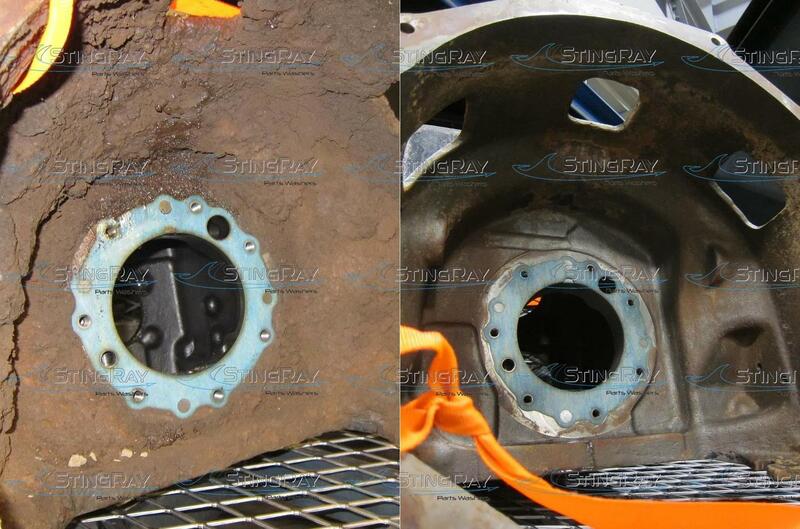 The photo above demonstrates the incredible cleaning efficiency of the StingRay aqueous transmission washer. Allison, Eaton, Fuller, Rockwell, ZF, Spicer and Mack truck transmissions and parts clean in less than 10 minutes for rebuilding and repair in a StingRay Aqueous Parts Washer. Prewash in less than 5 minutes.